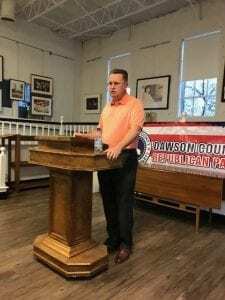 DAWSONVILLE, Ga. – Sen. Steve Gooch of Dahlonega and State Rep. Kevin Tanner of Dawsonville were the featured speakers at last night’s Dawson County Republican Party Meeting at the Bowen Arts Center. 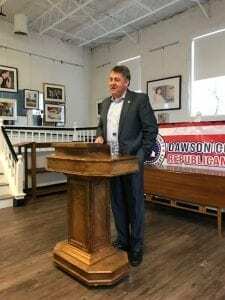 Gooch represents 200,000 north Georgia residents, including those in Dawson, White, Lumpkin, Union and Forsyth counties. The district is made up of about 75 percent Trump voters. Another issue he has spearheaded for several years is the expansion of high-speed internet access to rural communities. He and other legislators who understand that high-speed broadband internet service is essential to schools, businesses and hospitals made it a priority this year. They passed legislation that allows power companies and phone companies to begin selling internet service in rural areas. Tanner worked hard on getting new voting machines for the state. The bill passed in the House along party lines with Democrats opposed. The new machines, which will cost between $150 million and $200 million, will allow voters to cast a ballot electronically, print out a copy for their approval then scan it to have it recorded. Last night’s meeting was the first since the election of a new slate of officers at the County Convention. The new officers include Seanie Zappendorf (chairperson), Mike Berg (first vice chair) Pepper Pettit (second vice chair), Dale Smart (secretary) Katie Hulsebus (treasurer) and Norman Samples (committee member at-large). 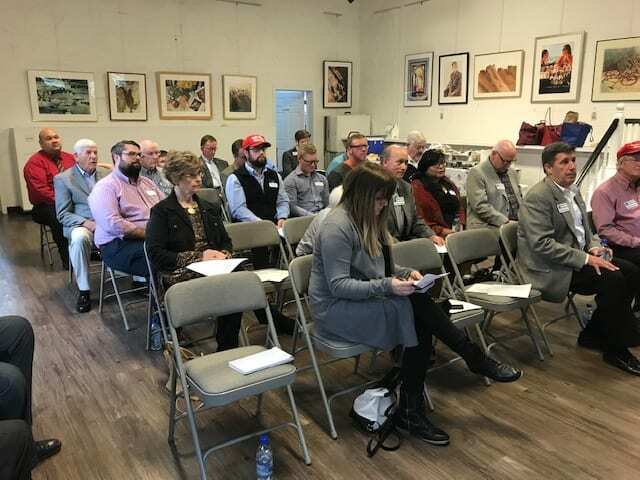 Among the elected officials who attended the event were Mayor Mike Eason, Commissioners Julie Hughes-Nix, Sharon Fausett, City Councilman Stephen Tolson and former Commission Chairman Mike Berg.